Short-term trading seems lucrative but involves a lot of risks. 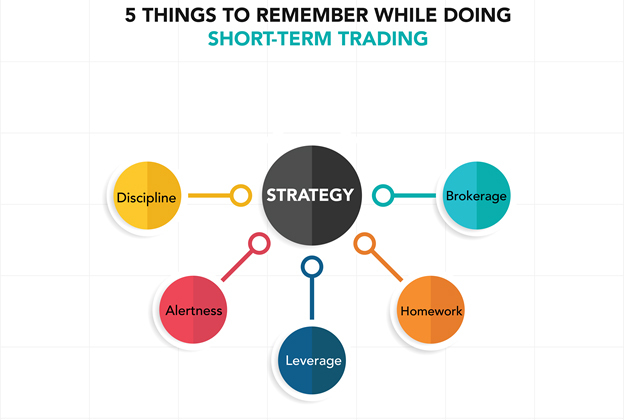 A short-term trade can last for as short as a few minutes to as long as several days. Short-term trading seems lucrative but involves a lot of risks. A short-term trade can last for as short as a few minutes to as long as several days. To survive this period and emerge successfully, you need a strategy. You must also understand the risk-reward ratio for each trade. Sometimes, success at short-term trading is termed as "luck"; nonetheless, the trick to always being "lucky" has to be mastered. You should be aware of your entry and exit points and stick to them no matter what. You should also know your stocks – their strengths and limitations – and how to not get greedy or panic. If you fail to trace and maintain your exit points, you might face massive losses. However, with the advent of online trading platforms, you can schedule buy/sell orders and trade in a disciplined fashion. You should be completely alert to global happenings. For example, when North Korea tested the missile, the stock market fell from 1-0.5%. News, both at the macro and micro levels should be studied, and strategies should be implemented accordingly. You should be very careful about the leverage. In an intra-day trade, you have the maximum advantage as margin required is just 10% of position. This way, profits can be amplified, but so can loss. Hence, it is advised to be prudent with leverage. Homework – before the day starts and after it ends – is very crucial. You must go through and analyze each chart, graph, and position of a stock before investing in it as the share market is highly volatile. While trading, most people only tend to look at the profit or the loss they incurred and often overlook the brokerage costs on the trade. Gains should be considered after deducting brokerage fee and the exit point should be booked. Many online trading platforms charge a flat brokerage fee today. Short-term trading is not everyone's cup of tea, but those who know the exact recipe enjoy it the most. Many times, success in short-term trade is committed to luck, but it is not the same as winning a lottery ticket. It takes guts, perseverance, and a disciplined mind to achieve it.